On the strength of four more victories last week-- bringing their total to 21, the Clear Lake baseball team has moved to the number five spot in the Class 3A rankings. The Lions posted three non-conference wins and then topped Algona Garrigan 14-4 to remain perfect in the league. The Lions will host St. Ed’s in an all-important doubleheader Saturday, July 2, to decide the North Central Conference champion. 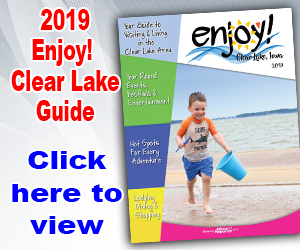 Game time is 1 p.m.
“These kids just finished off what could be the best three weeks Clear Lake baseball has ever seen, going 15-0 and outscoring our opponents 173-38, which included two ranked teams,” said Clear Lake Coach Seth Thompson. The Lions (21-4, 11-0) are at home Wednesday and Saturday. Saturday’s double-header against St. Edmond will likely will determine the conference championship. The Lions weathered the weather, as well as a tough challenge from St. Ansgar to earn a 10-7 victory in the first of two games played Tuesday, June 20. After gaining a 10-0 lead in the fourth inning of a five-inning game and sitting through two rain delays, the Saints put together a seven-run fourth inning to make it a 10-7 game. Clear Lake’s offense scored 10 runs on nine hits. They were helped by 10 walks. Zac Bendickson had a pair of hits in the game, including a double. He finished with two RBI. Elliott Neuberger also had two hits and two RBI. Michael Keenan had a hit which scored two runs. Ozzie Adams also had a hit which scored a run. Neuberger was the winning pitcher. The senior gave up two hits and struck out three. He walked one. Tanner Truesdell came in in the fourth and pitched one and two-thirds innings, giving up six hits and walking three. He struck out three. “Elliott did a nice job of coming back in and finishing the game off for us and preserving the win,” said Coach Thompson. 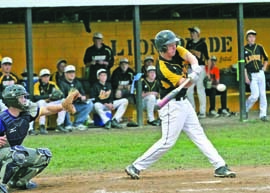 In the second game, Tanner Tusha drove in two run to help the Lion to a sweep with a 6-4 win. “In the second game, on a field that was full of standing water and having to play under some pretty poor lighting, we had to battle our butts off to get the win after getting down 4-0 after two innings in a five-inning game,” said Coach Thompson. Ozzie Adams and Tusha started the seventh inning (second extra inning) with two doubles that proved to be the difference. Lobdell threw the first four innings, giving up four hits, walking two and striking out seven. Adams, who earned the win, gave up two hits, walked one and struck out three.